Simple and inexpensive priming tools: a primer flipping tray and two hand priming tools with shell holders. Note the “comfort” enhancements of duct tape and/or thousands of rubber bands. Last time we talked about about ways to resize brass like a boss. This week, let’s look at some different approaches to the re-priming step. We’ll cover this from a “getting started” point of view. If you own something like a Dillon Precision Super 1050 progressive reloading press, you’ve spent somewhere approaching $2,000 and are auto-priming like there’s no tomorrow. Rock on! On the other hand, if you’re thinking about getting into reloading, or have just started, we’ll help narrow the approaches by looking a few different methods. To keep things simple, let’s consider three different methods: hand priming, single-stage reloading press priming, and progressive reloading press priming. This RCBS priming tool is built for comfort. Note the contoured grip! The thought process behind hand priming tools is that you can easily, and cheaply, prime hundreds and hundreds of cartridge cases per hour. Better yet, you can do this from the comfort of just about anywhere. “Hand priming tool” is a literal definition and most of them are small, light, and portable. Want to camp out in the family room? No problem, bring a box of cases, your priming tool, and an empty box for your completed cases. There’s another benefit of hand priming tools. You can control the pressure and depth of priming fairly well as you are pressing the new primer into place with a hand tool, not a hydraulic machine. After a couple hundred, you’ll develop a feel that tells you primers are seated correctly. Here’s how they work. First you clean, decap (remove the spent primer), and resize your brass. Most hand primers have a tray that’s large enough to hold a box of 100 primers. Holding your opened box of primers, turn the hand priming tool tray upside-down over the primer packaging tray, then flip the whole assembly. If done correctly, you’ve now got all 100 primers in the hand primer tool tray. You’ll notice the tray is ridged or textured. That allows you to gently shake the tray until all the primers are facing upwards, so they will insert correctly. When all the primers are oriented correctly, put the cover over the tray to prevent primers from spilling and flipping. Many hand priming tools use removable shell holders to hold the case still while a primer is pressed into place. The shell holders are sized to caliber. Once you’ve got the right shell holder in place, primers loaded and cover in place, you’re ready to prime. It’s a simple process. Insert a shell, squeeze the hand tool, and drive the primer into place. You’ll quickly learn the ideal angle at which to operate your hand primer so that the next-in-line primer falls into place by gravity. 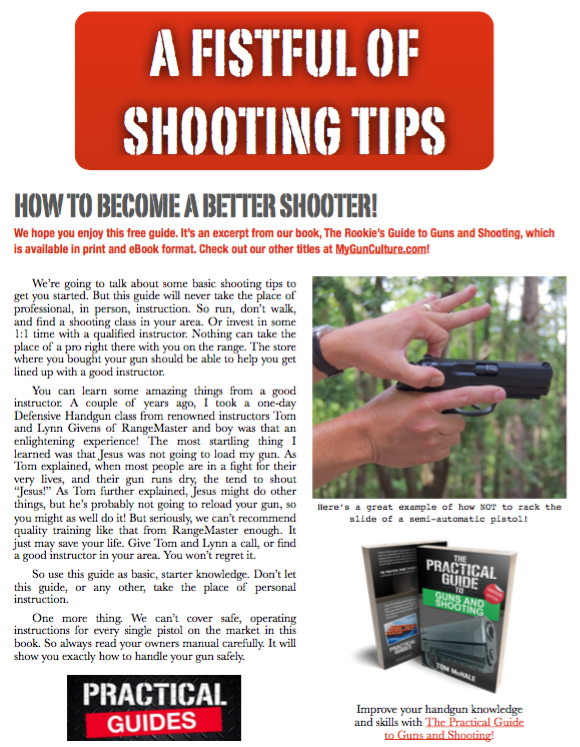 The Insanely Practical Guide to Reloading Ammunition! Get on our mailing list to get updates.